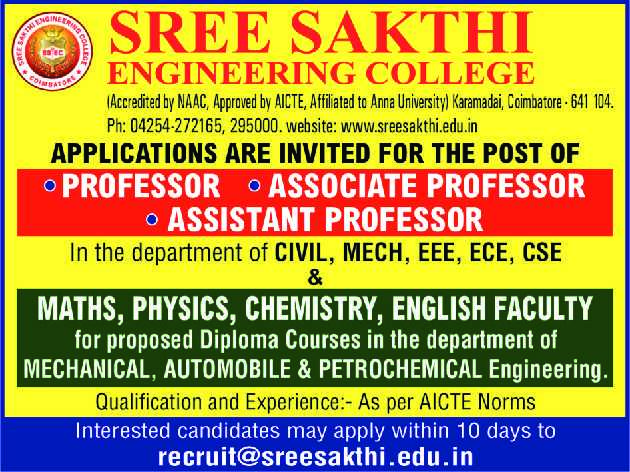 Sree Sakthi Engineering College, Coimbatore has advertised in THE HINDU newspaper for recruitment of Teaching Faculty- Professor / Associate Professor / Assistant Professor jobs vacancies. Interested and eligible job aspirants are requested to apply within 10 days from 27th March 2019. Check out further more details below. About College: Sree Sakthi Engineering College believes in Success Tomorrow, Begins with SSEC Today!, a private engineering college Founded in 2010 under the auspices of Sree Sakthi Charitable trust. The College is located at Karamadai, 25Kms away from Coimbatore on the Ooty to Coimbatore National Highways. The College offers five bachelor degree and one master degree. The college is affiliated to Anna University and Approved by All India Council for Technical Education.